My pal, Tommy Kane and his wife Yun just spent a few days with us in California. It was so good to have them with us and we spent a lot of time eating in good restaurants, wandering through Venice and, of course, drawing. I have known Tom for thirty years and we have drawn together for the last ten. Despite how close we are, when it comes to drawing we are quite different. Tommy is an illustrator, an artist who works toward beautiful finished pages, every one suitable for framing. His journals are immaculate, and each page is perfect from corner to corner. He just put out a lovely book of his work and it is a treat to have all that perfection in one place. The experience of looking at his journals is like looking at a final, published book—so immaculate, so rich. My style of drawing is far more hasty, slapdash and impatient. And that can be a problem when we draw together. Tom expects to spend hours and hours doing a single drawing. He has a very specific way of doing a page, starting with his uniball pen, putting in loads of careful hatching, then adding watercolors and finally a layer of bright pencil marks. He’d prefer to do the entire thing on location, perched on his little stool. He has a patient wife/traveling companion and has drawn this way all over the world. When we sit down together, as we did on the Venice Boardwalk and on Lincoln Boulevard, I find myself adjusting to his pace and do horrible overdrawn pages that don’t look like my normal work. I find it impossible with the way I draw to spend hours on a single page, Tom also compromises when we’re together and usually only manages to finish his line drawing before I start squirming and pacing and has to color his picture later on, from a photo. I don’t begrudge Tom his slow and careful pace. He manages to capture so much detail and observation and yet keep his work fresh and bright. I draw, like almost everything else, at a neurotic pace, and the luxury of time just stirs up the mud. Everyone has their own speed. Our friend Butch draws at a glacial pace, thinking nothing of spending ten or twenty hours on a page, D.Price, on the other hand, can knock out a drawing in three minutes. We have all drawn together and it’s like a tap dancer, a heavy metal guitarist, a tuba player and a sitarist trying to jam. Whenever I go on a sketchcrawl, I have to adjust to the group, moving toward the mean of all the people drawing together. And it’s good to challenge that someotimes, to go faster or slower to add variation and stretch. In the long run, though, the work I do with others is never my favorite. It’s more of a fun, communal, social experience than a satisfying artistic one. I’m not antisocial and I love to hang out with my friends. 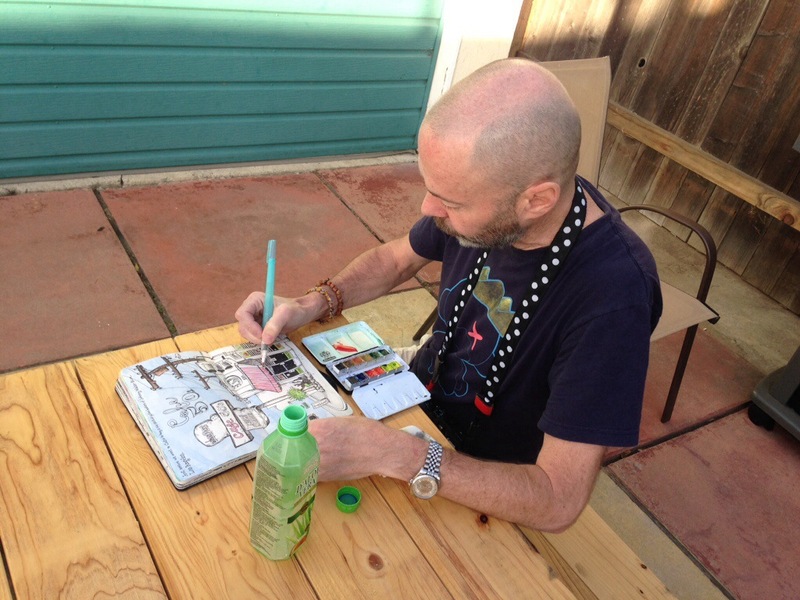 PS if you’d like to draw with Tommy Kane, join his klass at sketchbook skool. Next Post SBS Update: Roz! Great entry. Some of my friends think they want to photograph along side me. I have to explain it isn’t a good idea. That my idea of being done, and theirs won’t be the same. I work until my body hurts from lugging whatever gear I think i will need and always going for one more shot. Around one more bend, or till the light fades to black. Nothing worse then going with a friend to shoot an event, or special location and finding them done and wanting to get back home, especially if you shared a ride to the same location. It is hard not to seem antisocial saying ‘no’- but art making isn’t a social thing for a lot of artists. I think it is best to leave the sharing of the work for the social part of things . Though, mixing things up every now and then can be a bonus – as a general rule, I work alone. I’m one of those people who draw at glacial speed; but, I want to change. I want to be able to capture more in a shorter amount of time. I feel it expresses more of the emotion behind the image. Guess that would make me like a bagpipe player trying to play jazz. Hi Danny I agree. Somethings for some folks have to be done solo. My drawings are quickies! I’m so happy to learn that I’m not alone in this. I often wonder what I’d produce if I forced myself to slow down. Well two of my very first drawings were of old Victorian houses and I did sit out in front of them for a couple of hours start to finish. There was so much detailed bric-à-brac. I loved doing them. But mostly my journal pages are whipped out in minutes not hours. I don’t think I think, it just happens while not thinking. It’s more like enjoying the feeling of doing if that makes sense? I feel it’s a bit of an out of body experience that feels good! Fun thinking about this. I’m excited to see Tommy Kane’s new book, and to sit in his class! Thanks for sharing all this. Did you make a video with him? You and Tommy Kane are two of my favorites. 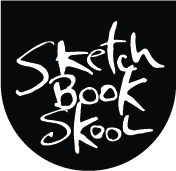 I’m signed up for Sketchbook Skool and before I did I remember asking if Tommy Kane would be involved…oh, and I’m right there with you on the I’d rather pee, nap and draw alone bit. Can’t wait for Klass to start. That was the only thing about you moving west that gave me pause. Danny without Tommy? Never! You may not match in style or pace, but you do have a well-matched friendship. Looks like a Schmincke water color set. It is likely Schmincke. He has a post on his Blog of “His Stuff” he uses. Can usually only do my most “serious” ha ha art alone. Don’t like to talk or watch others at the same time. Need quiet to get into the zone. To each his/her own. What kind of book is Tom working in? Love Tommy’s style and yours, Danny, for different reasons, and I’m inspired by both…though I’d have to say mine and Tommy’s are more similar. So looking forward to Skool, I will be rolling around in shared creative bliss like a dog in ripe fish! Sorry, that sounded so much better in my head than in type.